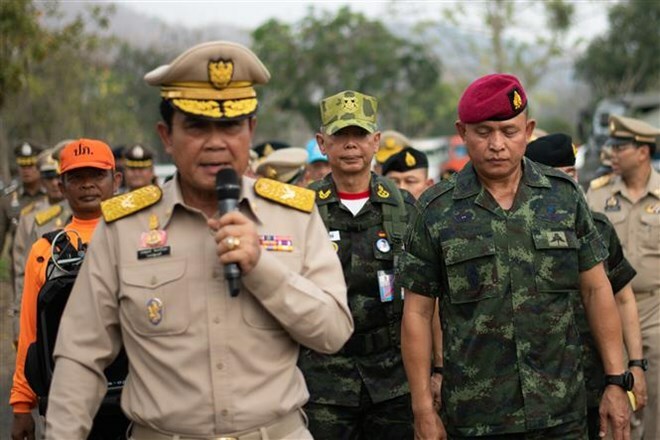 Hanoi (VNA) – Thailand’s army chief on April 2 warned the military will oppose any action that threatens the country’s system of constitutional monarchy after the election. Speaking at a news conference, General Apirat Kongsompong said the military would remain neutral in the election. He stressed the duty of Thai army is to protect, maintain and defend the institutions of nation, religion and monarchy. At the same time, Gen Apirat said the military would not allow a repeat of past mass street demonstrations. He told reporters that regardless of the election’s results, all sides must settle their differences in parliament. The Election Commission (EC) of Thailand has yet to announce final results of the general election. The results will not be approved until May 9 as relevant agencies need time to handle official complaints, of which there are 186 thus far, said the EC. The general election in Thailand took place on March 24 with more than 50 million people eligible to cast votes.